The World Animal Awareness Society – WA2S.org visited the Gulf shortly after the Deepwater Horizon rig explosion to survey the area, research access through the Unified Command system, and determine the need for further visual data collection as it pertains to the wildlife affected by this oil spill. 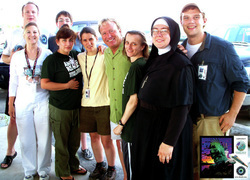 After the initial trip Executive Director Tom McPhee launched the ALL EYES ON THE GULF Expedition (AEOTGE). The AEOTGE is a scientific & film expedition to collect visual data of wildlife and the human element. The WA2S provides a non-biased window for the world to view this disaster. Our team has unique relationships with individuals and organizations in the region, such as NOAA, USFWS, EcoRigs.org, Sea Turtle Restoration Project, On Wings of Care, IBRRC, Audubon Nature Institute, US Coast Guard, LSU and residents in communities along the coast. Our team continues to film today and we are compiling ground breaking aerial and underwater photography with citizen submitted and volunteer footage. All of the WA2S.org data, as well as data from partnering organizations and individuals within the local communities, will be posted through this website. World Animal Awareness Society - ALL EYES ON THE GULF INTERACTIVE GOOGLE MAP - AEOTG Expedition interactive map including videos and photos from our team. Environmental Response Management Application (ERMA) - GeoPlatform.gov, powered by Environmental Response Management Application® (ERMA), is a web-based Geographic Information System (GIS) tool designed to assist both emergency responders and environmental resource managers who deal with incidents that may adversely impact the environment. This application is currently assisting with response operations for the Deepwater Horizon spill and data regarding this incident is displayed here and updated daily. 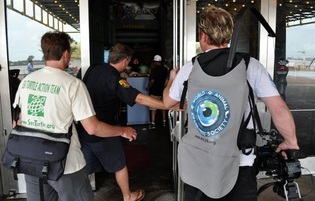 Skytruth Oil Spill Tracker - From the Ocean Conservancy and Surfrider Foundation. 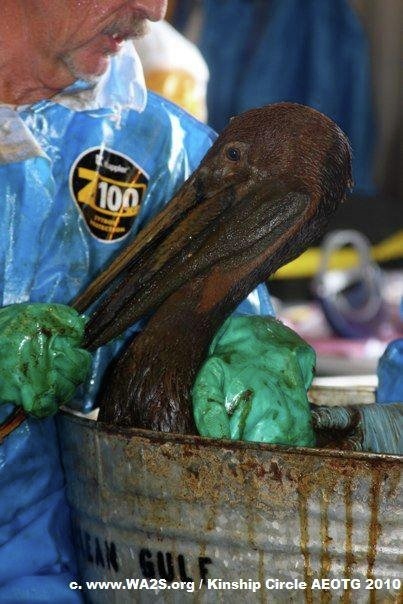 This site is hosted and supported by SkyTruth and is being made available to the many organizations that are tracking the impact of this terrible oil spill on the Gulf coastline. Anyone can contribute to this site! Just click on the "Submit an Incident" button and fill out the online form. You can post images and text, and include links to news articles and videos. Let everyone know what's happening where you are as a result of the spill. Seaturtle.org - Satellite Tracking of juvenile loggerhead turtles that were rescued, rehabilitated and released. 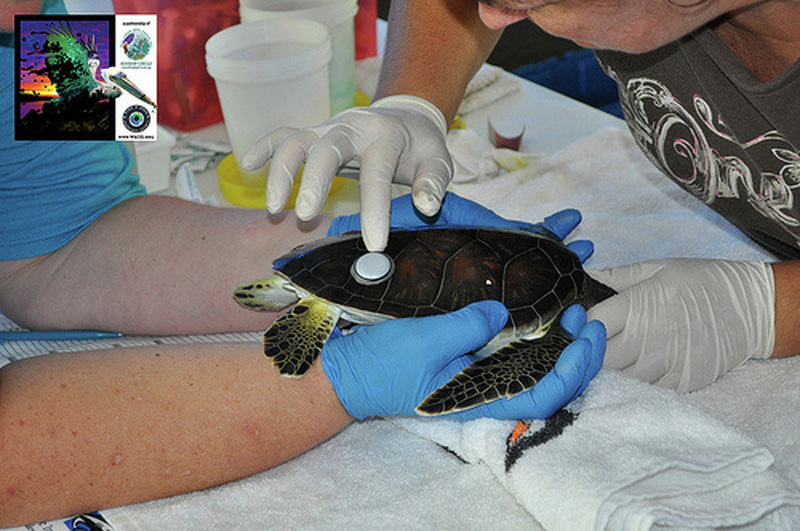 Institute for Marine Mammal Studies Sea Turtle Tracking - Follow Squirt, Skipper and four other rescued Kemp's Ridley sea turtles via satellite tracking as they resettle in their home in the Mississippi Sound. These sea turtles were all rescued during the oil spill and rehabilitated at the Center for Marine Education and Research before being returned to the Sound in November 2010. 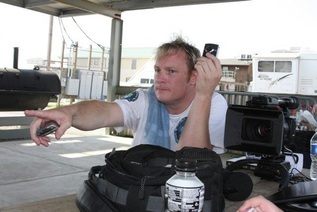 • Comb beaches, estuaries, nesting grounds and open waters - traveling hundreds of miles daily in LA, MS, AL, FL looking for distressed animals and to map the oil's impact. • Embed on planes and boats with US Fish And Wildlife, Coast Guard and other agencies / officials to monitor oil damage and wildlife impacts. • Document the oil's influence on animal habitat and survival. • Maintain a real-time map with photos, video, interviews, news. Volunteer Daily Field Notes - All of the World Animal Awareness Society, in partnership with Kinship Circle ALL EYES ON THE GULF Expedition volunteers kept daily field notes to accompany the photographs, motion pictures, and other data collected each day while exploring in the Gulf Regions from May through September 2010. Here's just one story: Meet Rachel Laskowski Kinship Circle volunteer and Jonathan Shurtz for World Animal Awareness Society - The video below is their 6th day of volunteer work in the Gulf - Perdido Key, FL - hear their introductions and watch as they spot an oiled bird. Special thanks to Holiday Harbor for allowing our team use of a boat. Rachel was part of the first team of volunteers and was in the Gulf for two weeks in June and then returned again in August. Smithsonian National Museum of History Google Earth MAP of invertebrate holdings from the Gulf - The National Museum of Natural History's Department of Invertebrate Zoology has developed an online map that provides information about invertebrates in the National Collection from areas impacted by the oil spill. In the Gulf of Mexico, over 57,000 invertebrates (points on the map) from 5,789 distinct collecting sites from 14 MMS survey programs (point colors) have been cataloged. Encyclopedia of Life - In order to increase awareness about the potential and actual impacts of this disaster on Gulf of Mexico biodiversity, EOL has put together lists of links with information about the species and habitats of the region. A recently published reference book about Gulf of Mexico Biodiversity (2009) lists 15,419 species within 40 phyla, ranging from single-celled microbes to seaweeds, plants, fungi, and a great diversity of invertebrate and vertebrate animals in the Gulf. EOL provides links to the pages of some iconic Gulf of Mexico species that may be affected by the oil spill. Restore the Gulf - Official website of the United States Government for all governmental resources surrounding the Oil Spill. Consolidated Fish & Wildlife Collection Reports - These are the consolidated numbers of collected fish and wildlife that have been reported to the Unified Area Command from the U.S. 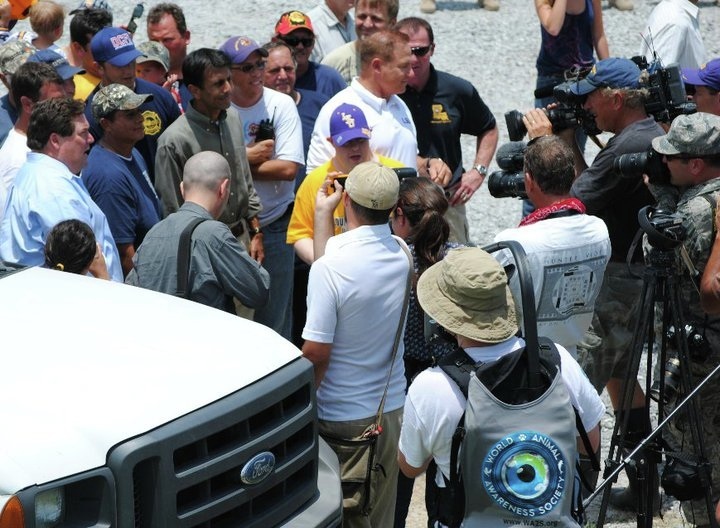 Fish and Wildlife Service (USFWS), National Oceanic and Atmospheric Administration (NOAA), incident area commands, rehabilitation centers and other authorized sources operating within the Deepwater Horizon/BP incident impact area. Fish & Wildlife - Impact summaries, photos, videos, transcripts, etc... for birds, fish, turtles, dolphins, whales, and other wildlife from the U S Government. 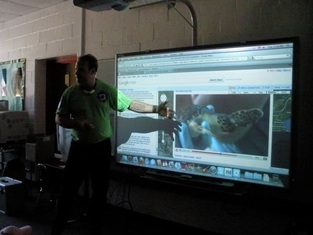 BP Global Gulf of Mexico Response - Making it right with the wildlife page that includes video, stats, and other details. The Ocean Portal from the Smithsonian's National Museum of Natural History - Lesson plans and activities on the following topics: How does an ecosystem recover from a major one-time insult such as an oil spill? and A kit you can create to help your students understand the impacts of the Gulf Of Mexico oil spill. Restore the Gulf Education Resources - Fact sheets from the U S Government that contain detailed and accurate information about the response to the Gulf oil spill on a variety of different health, claims, environmental and wildlife subjects. View the full collection or look at agency specific collections for the Environmental Protection Agency, Fish and Wildlife Service or Small Business Administration. Gulf of Mexico Foundation - A collection of Gulf of Mexico Classroom Resources recommended by the GMF. Natural Resources Defense Council - A collaboration between Bridge the Gulf, StoryCorps, and NRDC. Stories of human impact. Please note that we are posting data that focuses on the human / animal intersection. Videos in support of the ALL EYES ON THE GULF Expedition. A partnership of Kinship Circle and World Animal Awareness Society.